The Kalevala is considered to be the national epic of Finland and one of the most significant works of Finnish literature. 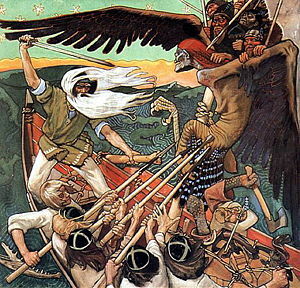 Compiled from Finnish and Karelian folklore in the nineteenth century by Elias Lönnrot, the Kalevala is credited for partly inspiring the emerging Finnish national awakening movement together with the idea of a Finnish identity and language that ultimately led to Finland's independence from Russia in 1917. The central plot of the epic traces the journeys of the bardic hero-shaman Väinämöinen in his quest for a mate, together with the theft of a powerfully magical mill called the Sampo. The name Kalevala can be interpreted as the "lands of Kaleva." The epic consists of 22,795 verses, divided into 50 cantos or "chapters." It has been translated into more than 50 languages and has been influential on the works of major authors from Henry Wadsworth Longfellow to J.R.R. Tolkien. The forging of the magical Sampo. The main character of the Kalevala is Väinämöinen, a shamanistic hero with the magical power of songs and music. He is born of the primeval Maiden of the Air and contributes to the creation of the world. Many of his travels resemble shamanistic journeys, most notably his visit to the belly of a ground-giant, Antero Vipunen, to find the words of boat generation. He plays the kantele, a Finnish stringed instrument that resembles and is played like a zither. One of his kanteles is made of the jawbone of a giant pike. His search for a wife is a central element in many stories, although he never finds one. For example one of the potential brides, Joukahainen's sister Aino, drowns herself instead of marrying him. He is also part of the group who steals the Sampo, a magical mill, from the people of Pohjola. Seppo Ilmarinen is a heroic artificer-smith (comparable to the Germanic Weyland and perhaps the Greek Daedalus) who crafted the sky dome, the Sampo and more. Ilmarinen is also one of the group who steal the Sampo. Louhi the Ruler of the North, is a shamanistic matriarch of a people rivaling those of Kalevala. She is so powerful as to pull the sun and the moon from the sky and steal the gift of fire away from the people of Kalevala. She promises her daughter to Ilmarinen the smith; in exchange he builds a Sampo for her. Väinämöinen's young rival is Joukahainen. He promises his sister Aino to Väinämöinen when he loses a singing contest. When Aino drowns herself, Joukahainen attempts to gain his revenge on Väinämöinen by killing him with a crossbow. He fails but his actions lead Väinämöinen to promise Louhi to build a Sampo in return for his rescue. 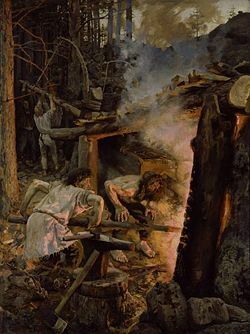 Vengeful, tragic, self-destructive Kullervo is born as a slave, persecuted by his uncle, sold to Ilmarinen, and exploited by Ilmarinen's wife, whom he later kills. Kullervo is a misguided and troubled youth often at odds with himself and his situation. He often goes into berserk rage and in the end commits suicide. Handsome but arrogant Lemminkäinen is brought back from the next world by his mother, who rescues his corpse from the river of Death which runs through Tuonela. Lemminkäinen is the third member of the group which steals the Sampo from Pohjola. Other chapters describe ancient creation myths, echoes of beliefs and rituals from two thousand years ago, the magical and shamanistic beliefs of ancient Finns, and the right words for magical spells of craftsmanship and healing. 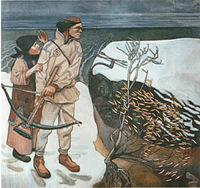 "Joukahainen’s revenge" by Akseli Gallen-Kallela. Cantos 1–10: The first Väinämöinen cycle: Creation of the world; the first man. Väinämöinen’s and Joukahainen’s encounter; Joukahainen promises the hand of his sister Aino to Väinämöinen in exchange for his life. Aino walks into the sea; Joukahainen takes revenge against Väinämöinen. The wounded Väinämöinen floats into Pohjola (Northland). Väinämöinen encounters the Maid of the North and promises her mother, the Mistress of the North the Sampo in exchange for her daughter/ Väinämöinen tricks the smith Ilmarinen to enter Pohjola, where he forges the Sampo. Cantos 11–15: The first Lemminkäinen cycle: Lemminkäinen steals the maid Kyllikki of the Island; they make a vow, which she forgets. Lemminkäinen travels to Pohjola to propose to the Maid of the North. 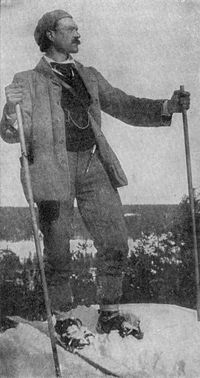 Deeds Lemminkäinen must accomplish to win her include: ski for the Demon’s elk, bridle the Demon’s horse, and shoot the Swan of Tuonela (the land of the dead). A herdsman kills Lemminkäinen and throws his body into the River of Tuonela, but Lemminkäinen’s mother awakens him into life. 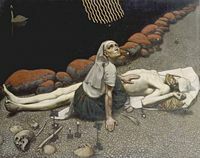 Lemminkainen's mother prays for his resurrection. Cantos 16–18: The second Väinämöinen cycle: Väinämöinen' travels to Tuonela where he meets Antero Vipunen in order to get spells for boat building. He then sails to Pohjola. Ilmarinen and Väinämöinen compete for the hand of the Maid of the North. Cantos 19–25: Ilmarinen's wedding: Ilmarinen accomplishes the deed required of him with the help of the Maid: plowing the viper-field, quelling of the wolves of Tuonela, and catching the pike out of the River of Tuonela. Other tales include the wedding of Ilmarinen and the Maid of the North and the story of the brewing of the ale. Cantos 26–30: The second Lemminkäinen cycle: Lemminkäinen is resentful for not having been invited to the wedding. He travels to Pohjola and wins the duel with the Master of Northland. An army is conjured to get back at Lemminkäinen; on his mother’s advice he flees to the Island of Refuge. Returning home he sees that his house is burned down. He goes to Pohjola with his companion Tiera to get revenge, but the Mistress of the North freezes the seas and Lemminkäinen has to return home. Cantos 31–36: The Kullervo cycle: Untamo kills his brother Kalervo’s people except for the wife who begets Kullervo. Untamo gives Kullervo several tasks but he sabotages them all. Kullervo is sold as a slave to Ilmarinen. After being tormented by Ilmarinen’s wife, he exacts revenge and the wife is killed. Kullervo runs away and finds his family unharmed near Lapland. Kullervo seduces a maiden, finding out later that she is his sister. Kullervo destroys Untamola (the realm of Untamo) and upon returning home and finding everyone dead, kills himself. "The Curse of Kullervo" (left) depicts this tragic character cursing the evil wife of Ilmarinen, who spitefully baked a stone in a loaf of bread intended for his lunch, on which Kullervo breaks his knife, the only inheritance he has from his father. Cantos 37–38: The second Ilmarinen cycle: Ilmarinen forges himself a wife out of gold and silver but finds her to be cold and discards her. Ilmarinen then robs the sister of the Maid of the North from Pohjola. She insults him so he rejects her as well. Ilmarinen tells Väinämöinen of the carefree life of Pohjola because of the Sampo. Cantos 39–44: The plunder of the Sampo (third Väinämöinen cycle): Väinämöinen, Ilmarinen and Lemminkäinen sail to get the Sampo. They kill a great pike out of whose jaw bone the first kantele is made. Väinämöinen lulls everyone in the hall of Pohjola to sleep by his singing. Then the Sampo is stolen. The Mistress of the Northland conjures a great army, turns herself into an eagle and fights for the Sampo. However, the Sampo falls into the sea. Cantos 45–49: Louhi's revenge on Kalevala: The Mistress of the North. Louhi, sends the people of Kaleva diseases and also a bear to kill their cattle. She hides the sun and the moon and steals fire from Kaleva. Väinämöinen and Ilmarinen restore fire and Väinämöinen forces the Mistress to return the Sun and the Moon to the skies. Canto 50: The Marjatta cycle: Marjatta gets impregnated from a berry she ate and begets a son. Väinämöinen orders the killing of the infant, who miraculously starts to speak and reproaches Väinämöinen for his ill judgment. The child is then baptized king of Karelia. Väinämöinen sails away leaving his kantele and songs as an inheritance to his people predicting a time when he is needed to return, rebuild Sampo and sing new songs. Elias Lönnrot (1802–1884) was a scholar and a district health officer in Kainuu, an eastern region of Finland, which in his time was an autonomous Grand Duchy of the Russian Empire. The gifted son and the eighth child of a tailor in the village of Sammatti, he entered the University in Turku (becomes the University of Helsinki) in 1822. During his university studies he became acquainted with folk poetry and his doctoral thesis was on Väinämöinen. He continued his studies, obtaining his medical degree in 1832. During a summer tutoring job in 1824 he encountered traveling Karelian rune singers from whom he heard some of the old poems. 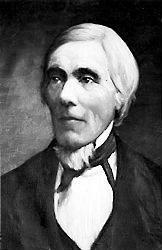 He started his poem collection journeys in 1827 and made a total of 11 field trips during a period of 15 years. Lönnrot arranged the collected poems into a coherent whole. In this process he merged poem variants and characters together, leaving out verses that did not fit in or composing lines of his own in order to connect certain passages into a logical plot. He even invented a few names which could be used for a character throughout the whole story. It has been estimated that the Kalevala comprises: 33 percent word-for-word recordings by the collectors, 50 percent material that Lönnrot adjusted slightly, 14 percent verses he wrote himself based on poem variants, and 3 percent verses purely of his own invention. Finnish folk poetry had long existed in the oral tradition and had begun to be recorded in writing by the 1670s. Sporadic collections were made of this poetry during the following two centuries. Finnish was then the language of peasants, whereas the literate and ruling classes spoke Swedish and Latin. In the nineteenth century, during the period of national awakening, collecting became more extensive and systematic. Altogether almost two million verses were collected during this time. Lönnrot and his contemporaries (e.g. A.J. Sjögren and D.E.D. Europaeus) collected most of the poem variants (one poem might have up to two hundred variants) scattered across the regions of Karelia and Ingria among the rural people. They carefully noted the name of the poem singer, his or her age, the place and the date of the performance in their records. During his fourth field trip in September 1833 Lönnrot got the idea that the poems might represent a wider continuity when poem entities were performed to him along with comments in normal speech connecting them. Finnish folk singers with kantele. The poetry was usually sung to tunes built on a pentachord, sometimes assisted by the kantele (a kind of five-string zither). The rhythm could vary but the tunes were arranged in either two or four lines consisting of five beats each. Sometimes the poems were performed antiphonally, sometimes they were a part of a "singing-match" between knowers of the tradition. Despite the vast geographical distances and cultural spheres separating the individual singers, the poetry was always sung in the same meter, the so-called archaic trochaic tetrameter. Its other formal features are alliteration and parallelism and inversion into chiasmus. The chronology of this oral tradition is uncertain. The oldest themes (the creation of the world and the origin of human culture) have been thought to have their roots in oral traditions of Balto-Finnic speakers around the Gulf of Finland two thousand to three thousand years ago. Rune singing was widely practiced throughout Finland until the 1500s when the growing Lutheran church declared this tradition to be pagan, forbidding its practice. However, in distant rural areas of eastern Finland and in Archangel Karelia across the Russian border, this tradition was still alive and could later be observed and recorded by Lönnrot. In parts of Archangel Karelia this art form survives till the present day. In 1833 Lönnrot began to publish the results of his collection trips in works such as Lemminkäinen, Väinämöinen, Naimakansan virsiä (wedding songs and poems). His goal, however, was to compile these songs and poems into one comprehensive epic in the vein of Homer's Iliad and Odyssey. The first version of Lönnrot's compilation, Kalewala, taikka Wanhoja Karjalan Runoja Suomen kansan muinoisista ajoista (The Kalevala, or old Karelian poems about ancient times of the Finnish people), also known as simply the Old Kalevala, published by the Finnish Literature Society in two volumes in 1835–1836. (Lönnrot signed the preface on February 28, 1835.) 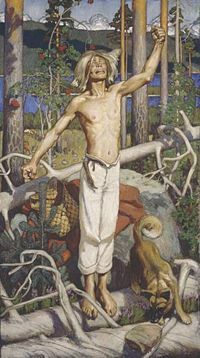 The Old Kalevala consisted of 12,078 verses or 32 poems and was a closer match to the original performances of the folk singers than his subsequent work. Lönnrot continued to collect new material, which he integrated into a second edition, Kalevala (the Kalevala), published in 1849. This "new Kalevala" contains 50 poems, and is the standard text of the Kalevala, the National Epic of Finland. In this edition Lönnrot accomplished his goal of melding together the various strands of poems from the traditions of ordinary folk into a cohesive tradition-oriented epic. Of the five full translations into English, the older translations by John Martin Crawford (1888), William Forsell Kirby (1907), and the more recent Eino Friberg translation (1989), follow the original rhythm (Kalevala meter) of the poems (which may sound cumbersome to English ears). The scholarly translation by Francis Peabody Magoun Jr. (1963) is an attempt to keep the literal meaning of the poem intact for study and preservation of the tradition. 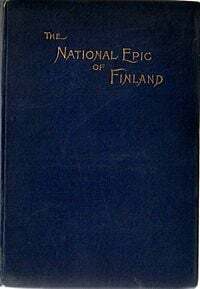 It is written in prose, the appendices of this version also contain many notes on the history and culture of the poem, comparisons between the original Old Kalevala and the version most known today as well as a detailed glossary of terms and names used in the poem. The most recent version by the poet Keith Bosley (1998) is written in a more fluid linguistic style. This translation is often recognized as the leading version. A notable partial translation of the German translation (by Franz Anton Schiefner published in 1852) was made by Prof. John Addison Porter in 1868 and published by Leypoldt & Holt. An article on this version is available here. So far the Kalevala has been translated into 50 languages. As a major part of Finnish culture and history, the influence of the Kalevala is widespread in Finland from music to fine arts. The Kalevala's influence has also been felt in other cultures around the world although to a lesser degree. The Kalevala Day is celebrated in Finland on the 28th of February, which is when Elias Lönnrot dated his first version of the Kalevala in 1835. Several of the names in Kalevala are also celebrated as Finnish name days, although this has no direct relationship with the Kalevala itself. One of the earliest artists to depict a scene from the Kalevala was Robert Wilhelm Ekman. One drawing from 1886 depicts Väinämöinen playing his kantele. Aarno Karimo was a Finnish artist who illustrated the beautiful Kuva Kalevala (published by Pellervo-Seura in 1953) who unfortunately died before completing it. Hugo Otava finished it using original sketches as a guide. In 1989 the fourth full translation of Kalevala into English was published, richly illustrated by Björn Landström. The Kalevala has not only been translated into over 50 languages but it has also been retold in many languages and adapted to different situations. The most famous example of the Kalevala's influence upon another author is J.R.R. Tolkien. He claimed the Kalevala as one of his sources for the writings which became the The Silmarillion. The story of Kullervo has been extensively used in the Silmarillion. Echoes of the Kalevala's characters, Väinämöinen in particular, can also be found in the wizards of The Lord of the Rings. The German-language translation of the epic was an inspiration for Henry Wadsworth Longfellow's 1855 poem, The Song of Hiawatha, which is written in the same meter (trochaic tetrameter). It also inspired the British science fiction writer Ian Watson to write the Books of Mana duology: Lucky's Harvest and The Fallen Moon. It is often claimed that the Estonian national epic Kalevipoeg (compiled and written by Friedrich Reinhold Kreutzwald, first published 1853) was partly inspired by the Kalevala, mainly because both Väinämöinen and Ilmarinen are mentioned in the poem and the story of the Kalevipoeg (Kalev's son) bears some major similarities with the Kullervo story. The children's book Koirien Kalevala (The Canine Kalevala) was written and illustrated by Mauri Kunnas. (Translated into English by Tim Steffa). This book inspired the American (U.S.) cartoonist Keno Don Rosa to draw a Donald Duck story based on the Kalevala, called The Quest for Kalevala. The Neustadt Prize winning poet and playwright Paavo Haavikko, regarded as one of Finland's finest writers, is also known to be greatly influenced by the Kalevala. Kullervo is one of the major influences on British fantasy author Michael Moorcock's sword and sorcery anti-hero, Elric of Melniboné. 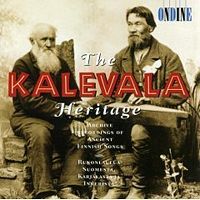 Because of the folk music history of the Kalevala there have been several folk music records and anthologies based upon or claiming inspiration from the Kalevala. Arguably the most famous Kalevala-inspired music is that of the classical composer Jean Sibelius. Twelve of Sibelius' best known works are based upon and influenced by the Kalevala, most notably his Kullervo Symphony. There are also three contemporary operas based on the Kalevala (Sammon ryöstö, Marjatta, and Thomas) composed by Einojuhani Rautavaara. A Finnish progressive rock band called Kalevala became well known in the 1970s. It made three albums and an anthology set was published in 2004. The Finnish rock band Amorphis based several concept albums on the Kalevala using the original translation as lyrics. In 2003, the Finnish progressive rock quarterly Colossus and French Musea Records mobilized 30 progressive rock groups from all over the world to compose musical pieces based on assigned parts of the Kalevala. The result was a three-disc, multilingual, four hour epic of the same name. In 1959 a joint Finnish/Soviet production entitled Sampo (aka The Day the Earth Froze) was released, inspired by the story of the Sampo from the Kalevala. In 2005, a film was announced, called Jadesoturi (aka Jade Warrior), based upon the Kalevala and set in Finland and China. This film was released in Finland on October 13, 2006. Several interpretations for the themes in Kalevala have been put forward. Some parts of the epic have been perceived as ancient conflicts between Finnics and Samis. In this context, the country of Kalevala could be understood as Southern Finland and Pohjola as Lapland. However, the place names in Kalevala seem to transfer the Kalevala further south, which has been interpreted as reflecting the Finnic settlement expansion from the South that came to push the Samis further to the north. Some scholars locate the lands of Kalevala to East Karelia, where most of the Kalevala stories were written down. In 1961 a small town of Uhtua in the Soviet Republic of Karelia, was renamed "Kalevala," perhaps to promote that theory. Proponents of a Southern Kalevala argue that the name Kaleva probably was first recorded in an atlas of al Idrisi in the year 1154, where a town of qlwny (or tlwny) is recorded. This is probably present-day Tallinn, the capital of Estonia, known in old East Slavic sources as Kolyvan. The Finnish word Kalevan ("of Kaleva") has almost the same meaning as Kalevala. The Saari (literally "the island") might be the island of Saaremaa in Estonia, while the people of Väinölä might have some resemblance to the Livonian tribe of Veinalensis in present-day Latvia, mentioned in the thirteenth century chronicle connected to Henry of Livonia. Ancient Finns, Estonians and Livonians spoke similar Finnic dialects and are thought to share common ancestry. "Kalevala – The Finnish National Epic", Virtual Finland, Retrieved February 20, 2007. Lauri Honko, October, 1998; "Back to Basics", Contents of Folklore Fellows Network 16, Retrieved February 21, 2007. "The Mythical Egg", Juminkeko, Information center for Kalevala and Karelian Culture, Retrieved February 21, 2007. Ismo Kajander, "Songlands of the Kalevala", Books from Finland, Retrieved February 21, 2007. Michael Branch, "Kalevala: from myth to symbol", Virtual Finland, Retrieved February 21, 2007. SKS Finnish Literature Society. (in English and many languages) Retrieved October 2, 2008. "Mies Nimeltä Lönnrot", Kouluportti (Finnish language), Retrieved February 21, 2007. Arthur W. Wright, "Review of Prof. John A. Porter's Translations of the "Kalevala", Making of America Cornell University Library Bibliographic Citations, Retrieved February 21, 2007. Crawford, John Martin, trans. (original 1891) 2006. The Kalevala: The Epic Poem of Finland. reprint ed. BiblioBazaar, ISBN 978-1426411939. Kirby, William Forsell, trans. 1951, The Kalevala: Or the Land of Heroes. J.M. Dent/E.P. Dutton ISBN 1858101980. Lonnrot, Elias, Jr., author; Magoun, Francis Peabody, trans. (1963) reprint ed. 2006 The Kalevala: Or Poems of the Kaleva District. A prose translation withforeword and appendices by Francis Peabody Magoun, Jr. Harvard University Press; Reprint edition, ISBN 0674500105. John Martin Crawford, "Kalevala: the Epic Poem of Finland—Complete", Project Gutenberg. Elias Lönnrot, John Martin Crawford (tr. ), 1888; "The Kalevala", sacred-texts.com. "The Kalevala's Contents Poems", Kalevala. This page was last modified on 10 April 2018, at 18:59.